The advantage of being an artist who works as an art handler is the continued opportunity for advanced study, especially if you can find yourself working inside your discipline on the job. For the stone sculptor, handling other stone sculptures offers us a glimpse not just how these pieces were made but how they feel. The reward becomes both aesthetic and technical in the execution of our own work. It’s a personal blessing to have been responsible for master work as diverse as ancient Chinese, Classical Western and modern sculpture. Generally, artists find themselves as a result of systems/ schools/ teachers. Awareness of tools and aesthetics start from this exposure, along with going to galleries, museums, reading, listening and hanging out. If we're able, we travel, perhaps attend graduate school or an atelier, find a peer group and begin our careers. Sometimes we find work in a foundry or other Arts related business. Our tool box is filled with what we've been given and our individual creativity, ambition and circumstances finds the other stuff which defines our voice and art however we can. 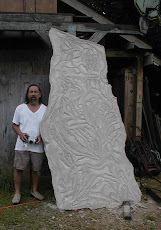 I am a stone carver. 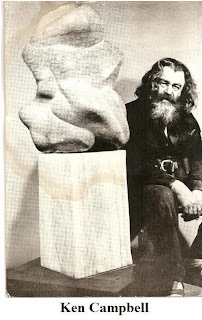 I studied under a great teacher/ artist/ stone carver: Kenneth Campbell for about 5 years in the University system. He came from Boston/ Provincetown, lived and worked in NYC, maturing in the midst of what we now call Abstract Expressionism. He was @ the center of that era’s star formation. The “Club” use to meet, drink and hang out in his studio. He was a true believer/ practitioner. As a result, his method was abstract and non-objective and so was his teaching method. There wasn't much to talk about because for most it was nonsense with no real nouns except for the stone you're working on, to look at as an example. He wanted us to not copy anything and to find our own way thru the process of working/ being. He didn't always carve stone. He was a draughtsman and a painter. In his forties, he told me, “The objects just popped out of the canvas." William de Kooning showed him that. To become a sculptor was the next natural step. However, because he started late, he was basically self taught. His technique, idiosyncratic and personal, is a pure expression of what Abstraction demands. I didn't know that until I got my first art handling job. As an artist, most of the time, except for your own work, you're only allowed to look at other's work. You cannot touch it. If it's a painting, a photo or wall piece, you cannot look at the back of the piece to see how it’s made. If it's a sculpture put against a wall you can't get critical distance to understand the 3rd dimension. We learn to know Art mostly as a visual experience and that becomes a valuable virtual tool. 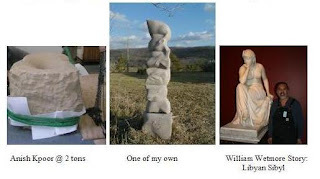 Stone sculpture does not exist only in the visual world. It can be heavy, big and dangerous. Injuries happen all the time. Handling it requires an intuitive reading of balance and weight. Damage usually happens on the first move. With the variety of forms we handle, from ancient to modern, the ability to adjust equipment, tools and personnel brought to the job, immediately, describes the quality of our efforts. Handling these sculptures in Museums, Galleries and Private Collections is an eye opener. You have to be perfect not just in the technical aspects of the project but also in the protocol with everyone involved. There's a lot at stake. Communication of intention and then it's execution defines us. Ambiguity equals doubt. 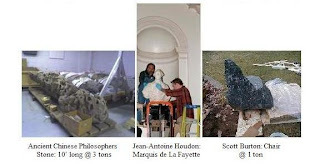 As an example, generally, if you go to any collection with 19th century marble sculptures you will see that most if not all are chipped at the bases. It’s understandable for ancient sculptures to be damaged; visually the broken parts have been fuel for artists the last few centuries, but in more recent times the chipping is the result of failed moves and a reflection of the quality of the art handlers and their techniques. It is unacceptable now. I remember on my first jobs moving stone sculptures as an art handler, what I learned from Ken Campbell didn't communicate well. On his own stuff, he used construction scaffold with a piece of galvanized i-beam cut from a highway girder. He wasn't a modern rigger with slings, trolleys and gantry's, he used ropes and knots, actual ship rigging, which he learned growing up in New England along with a lot of manual tricks: wood shims and balance. Bringing a similar tool bag brought a lot of ridicule and questions, especially when I was around professionals: museum staff, rigging companies, and collectors, who were dogmatic in what was acceptable. I had to adjust pretty quickly and learn to communicate in their terms, if I wanted to be included in that group. For a long time art handlers were only there to listen and assist. I understand now that that’s correct. There is a deep need to elevate skill sets and protocol, especially as the projects get difficult and participant responsibilities more examined. However, for the Artist,with practice and sensitivity, awareness/techniques discovered and nurtured in the studio can become unique, specialized tools, capable of complimenting and adding to, current professional Art moving standards, especially, when all the pragmatic choices seem to have run out: the Art in Art Handling. I'm curious about your personal work. The photos you show look good-can you show the other views? The ability to carve stone into a living piece is truly a gift. I envy your talent. Hello old friend...it's wonderful to be a carver and to have known you in those formative years. All the best and I hope our paths cross again one day.